The Bosphorus has mesmerized and captivated me many times. It’s one of the dozens of reasons I keep returning to Istanbul. It’s as if some mystical force keeps pulling me back in; or maybe it’s simply the pure beauty of the Bosphorus. Whatever the reason, I’ve decided to make another visit to Istanbul later in September. Yesterday, I booked my tickets and then started looking through three years worth of photos since it was a chilly, rainy day here in Warsaw. I realized how much photo editing still remains to be done. Anyway, you’ll find hundreds of restaurants with prime locations along the water or on the city’s hilltops where you can gaze at the bridges while you eat your Turkish mezes. We often took visitors to Reina and the manmade island of SuAda for their views when we lived in Istanbul. Last year, we also enjoyed a splendid dinner at Ulus 29 for our second wedding anniversary and watched the lights change on the Bosphorus Bridge. Looking out from SuAda to the Bosphorus Bridge in Istanbul. It’s interesting to think about how many of my memories end up revolving around the city’s bridges. I never realized it until I started looking through all our photos yesterday. Visits from family and friends. Turkish breakfasts on the weekend. So I hope you enjoy my trip down memory lane. Soon, I’ll have some new memories from Istanbul to share with you. The Bosphorus Bridge at dusk as seen from a park just north of Ortaköy. The rainbow colors displayed on the Fatih Sultan Memhet Bridge. Looking out over the Golden Horn from Mikla's rooftop bar. 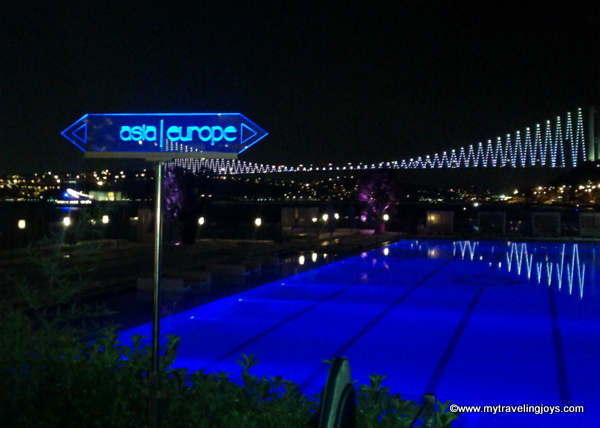 View of Fatih Sultan Memhet Bridge from Tapasuma Restaurant on the Asian side. Also, try and check airfares with Pegasus, Turkish Air, Sun express. Sometimes you can get some really good deals in advance, depending on where you are coming from. Those are beautiful photos! The first one is stunning! it sounds like fall has landed in warsaw! we are still hot and sticky here. the bridges are beautiful! we live in the city of bridges and i love them all. can't wait to see what you do when you go back to istanbul! @Svetlana, yes, Sept. and Oct. are still really nice in Istanbul! @Moe, sometimes you just get lucky with a great shot! ;-)Can't wait to see those painted stairs soon! @Joyce, Yep, until Wednesday, fall weather is definitely here! At least, the sun returns just in time for our friends visiting us from Istanbul. Indeed mesmerising, gorgeous shots Joy!